different types and sizes a test run to see what best suits your needs. machine needles which get bigger as their size gets larger. 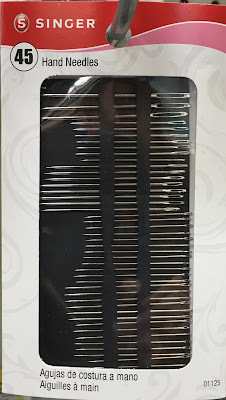 As you can see in this multi sized package of Sharps, size # 1 is the largest needle and size # 5 is the smallest. Do you cringe at the thought of threading that teeny tiny eye? Well, have no fear. Split Eye/Calyx Eye – A general purpose needle with a split on the outer edge of the eye for easy threading. In my experience, when this needle is pulled through multiple layers, the thread can pull out of the eye. 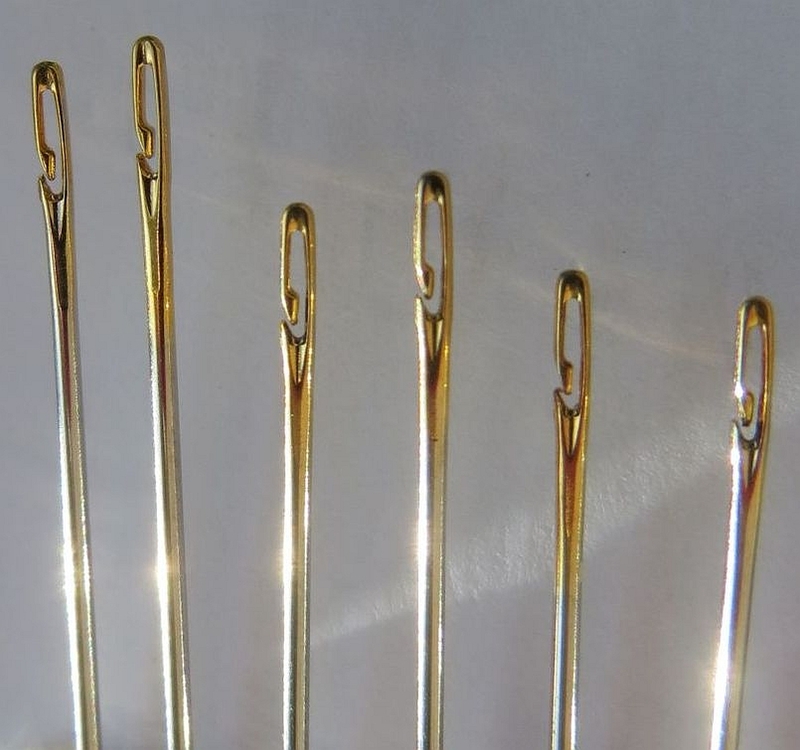 SENCH™ – These needles easily load from the side so you don’t have to worry about your thread slipping out of the eye. 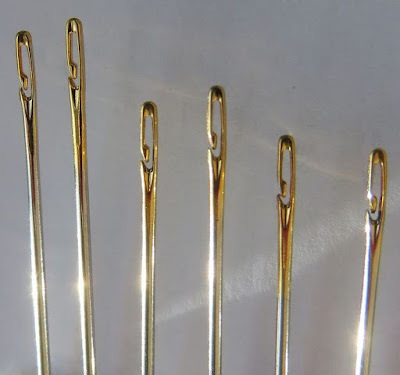 They come in three sizes for general sewing. 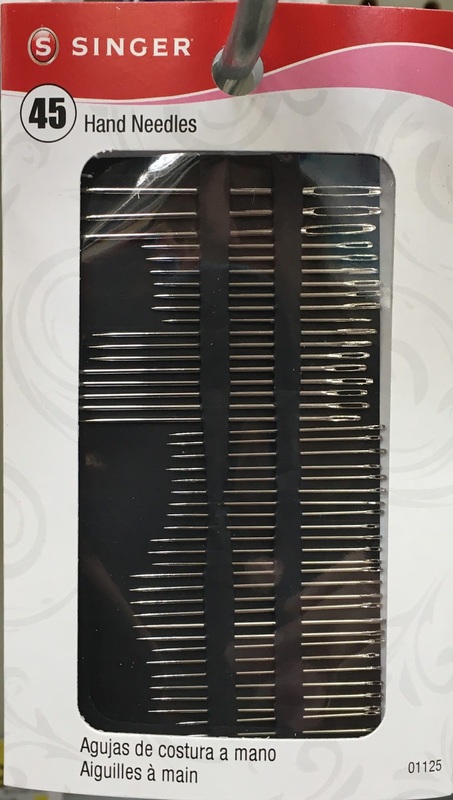 Spiral Eye® – These needles also load from the side and come in a variety of sizes for all types of sewing. They are made from surgical stainless steel. Here’s a little break down of some of the more commonly used needles. Ball Point/Jersey – Has a rounded point that slips between the threads on knits and stretchy fabrics. Sharps – An all purpose needle with a round eye. Great for appliqué. Betweens – Same width as a Sharps but approximately ¼” shorter. Has a small round eye that easily moves through multiple layers of fabric. Usually the choice for hand quilting. 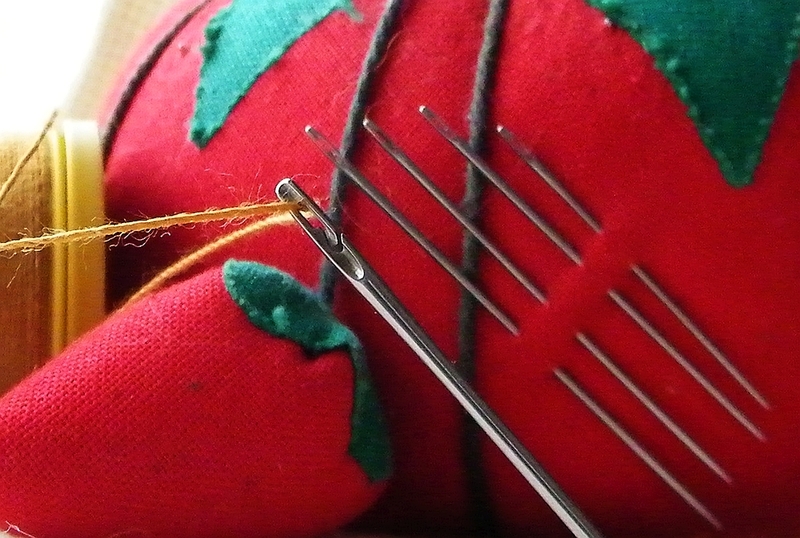 Embroidery/Crewel – Same sizing as a Sharps but they have a larger eye to accommodate multiple strands of thread. a quick gift for a friend. Pattern designed by Amy Barickman – Indygo Junction. This delicate vintage inspired sewing collection would please any sewing enthusiast. Each pattern is quick & easy to sew for yourself or as gifts for your sewing friends. Personalize with a machine or hand embroidered initial and then mix & match fabrics in your favorite colors and patterns. Etui or needle holder pattern teaches freezer paper applqiue, quilting, layering and light embroidery. This entry was posted in Helpful Tips, Helpful Tools, Notions, patterns. Bookmark the permalink. my friends thought it was great too. Anyhow, I just wanted to let you know that I appreciate what you’re doing here.